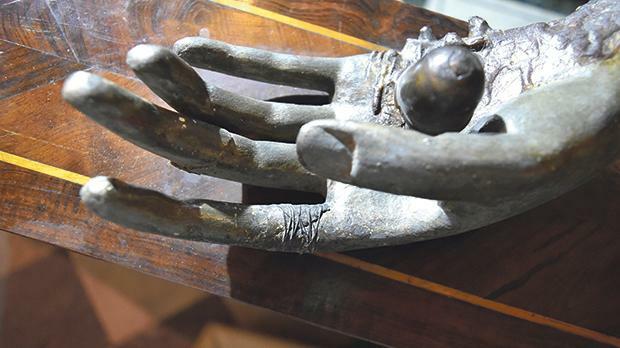 Pilgrims, art enthusiasts and academics will meet at a symposium on Friday during which new findings on the 17th-century miraculous crucifix venerated at the Franciscan church of St Mary of Jesus (Ta’ Ġieżu) in Valletta, will be revealed. Legend has it that Sicilian sculptor Fr Innocenzo da Petralia woke up one morning to find the head of the crucifix he was still working on complete. The restorers applying Japanese paper as a protection measure during transportation of the crucifix. 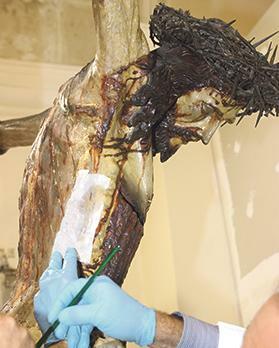 The severely damaged crucifix underwent numerous studies at the start of a conservation and restoration programme and it is what was discovered throughout the process that will be communicated during the event. 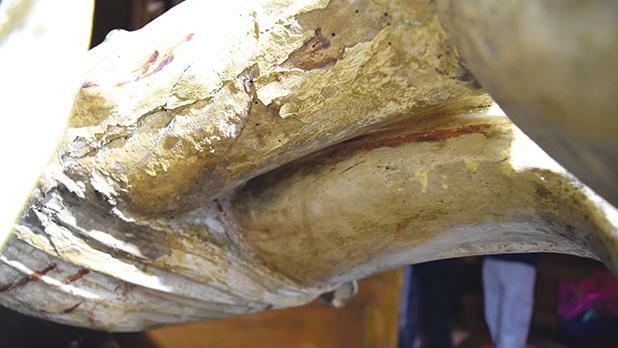 “These preliminary studies, consisting of X-rays, scans and other scientific research methods, confirmed that the crucifix was in a state of deterioration, in particular the back part of the effigy,” Keith Scicluna, the treasurer of the Archconfraternity of the Miraculous Crucifix and project coordinator, said. 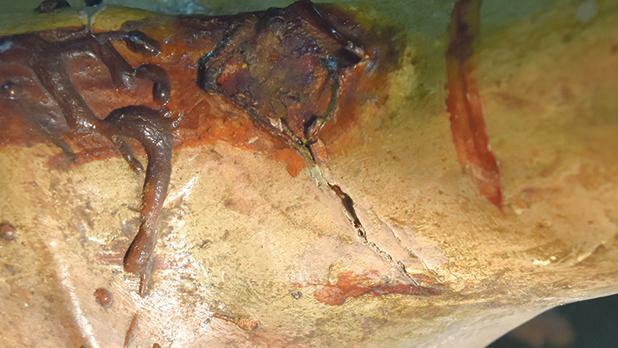 “A detoxifying treatment was also carried out to eliminate any traces of parasites,” he added. The project was entrusted to the Art Conservation Consortium (ACC), set up specifically to undertake the project. The restoration per se started only a few weeks ago and mainly involves the cleaning process of the whole crucifix and the consolidation and restoration of the deteriorating parts. The conservation aspect consists of the team of experts monitoring the climatic conditions of the crucifix’s niche and its surroundings because the damage was probably caused by environmental factors. “All data, including temperature and humidity, are being gathered on an hourly basis and recorded,” Mr Scicluna said. Architect Andrew Ellul will then help establish the best conditions for the crucifix. The project also includes the restoration of two paintings flanking the crucifix. These works, depicting the Holy Mary and Mary Magdalene, are attributed to the circle of Maltese painter Stefano Erardi. Bank of Valletta is funding the project, which, according to Mr Scicluna, will cost over €30,000. The archconfraternity is also carrying out other works in the niche and the side chapel dedicated to the crucifix. 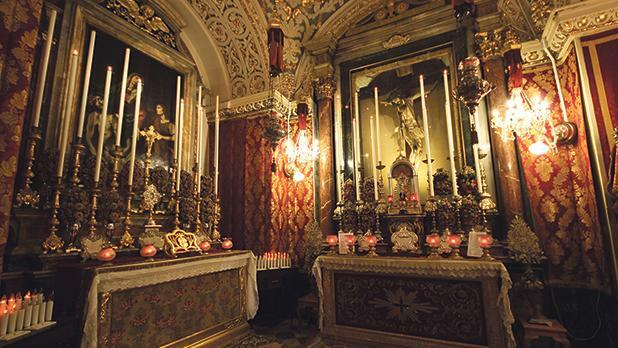 These include the restoration and polishing of the marbled altars, a new lighting system, new tapestry in the niche, new valances to adorn this chapel and the restoration of another painting of Our Lady of Sorrows by Erardi. 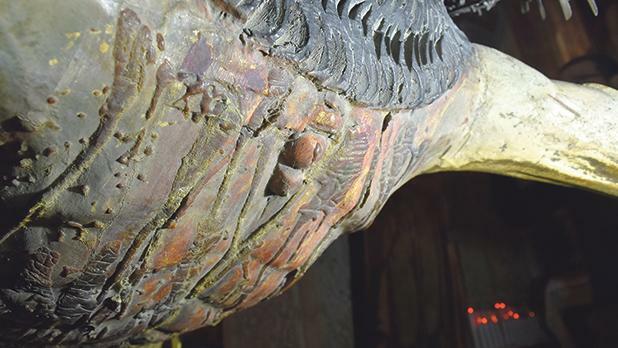 The crucifix suffered severe damage over the years, attributed to the environmental factors. Mr Scicluna noted that they are also awaiting results to establish the work that needs to be done in a crypt situated below the crucifix chapel. The crypt has been closed for a long period of time. The archconfraternity is receiving donations to cover the niche and chapel restoration expenses, which are expected to add up to circa €20,000. The symposium, chaired by President Marie-Louise Coleiro Preca, will be conducted by Giuseppe Fazio, a lecturer at the Accademia Delle Belle Arti in Palermo. He studied the life and works of da Petralia. Art historian and ACC chairman Christian Attard will delve into the historical and contextual background of the Ta’ Ġieżu crucifix and Michael Formosa will give insights into dating, woodwork and how the climatic atmosphere can influence the crucifix. Conservator and restorer Adriana Alescio will talk about the ethical issues involved in the conservation process and head conservator Fr Charles Vella will go into detail about the interventions, conservation and restoration process. The symposium will also be addressed by archconfraternity secretary Anton Cassar, ACC curator Cynthia de Giorgio and Bank of Valletta CEO Mario Mallia. It will be held at Ta’ Ġieżu church and starts at 7pm. Entrance is open to all and is free of charge. An open day will be held on Saturday giving the opportunity to the public to see the crucifix and the work carried out so far. The crucifix can be viewed between 8am and noon and from 5 to 7pm, except during Mass at 11am and 6.15pm.